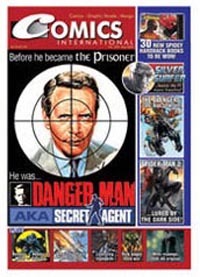 The current issue of the top UK news magazine for the comics industry, Comics International (No.202) includes a five page article on the history of Danger Man comic strips. The well-illustrated feature covers all the British and American appearances of John Drake in comics and children's annuals, including items such as unseen character sketches. will spotlight The Prisoner comic strips and spoofs. magazine costs £2.99 / $4.99. For more images click HERE. With thanks to Lew Stringer for this news item, and Comics International for the article's mention of this website.